Do you ever wish you could forgot your morning shower in favor of a few extra minutes for sleep or a coffee run? Fortunately, there is an incredibly easy way to make hair look amazing without washing, conditioning, and styling it every single day. You can do this with one of the best things since sliced bread: dry shampoo. Using a dry shampoo lets you skip washing your hair, adds volume, and absorbs oil, grease, and odors from the scalp. It often comes in a travel size, making it ideal for saving time after the gym. We’ve reviewed the best of dry shampoo brands right here. We’ll help you find the most reliable product for your hair type, and let you know exactly what you’re getting with each product; whether it’s cruelty-free, organic, has a great scent, or is easy on the wallet. 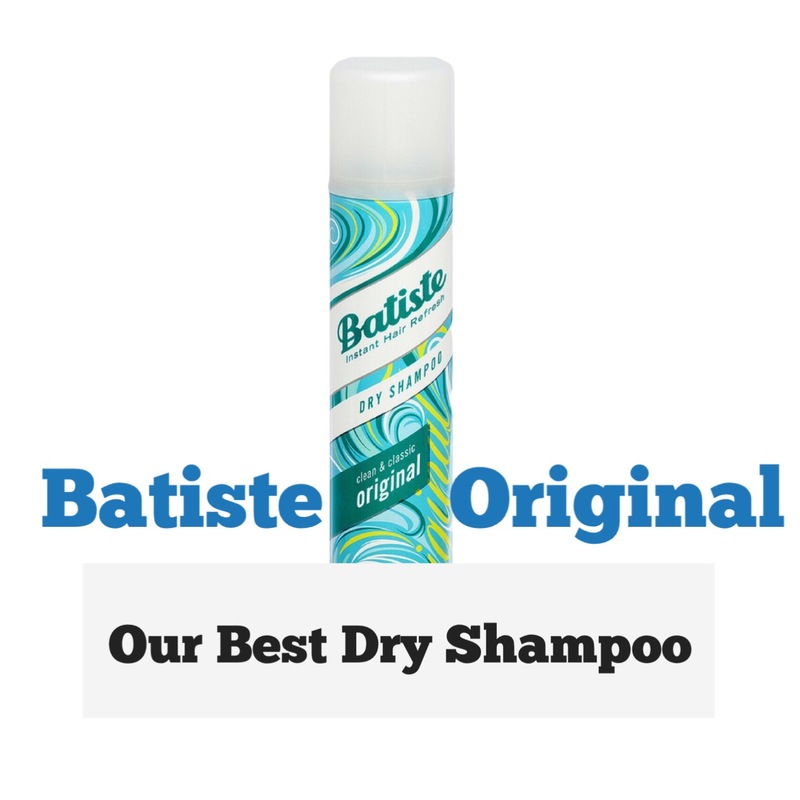 Batiste is perhaps the most top-rated dry shampoo on the market today, and arguably the best dry shampoo you can get your hands on. As one of the best dry shampoos for oily hair, Batiste’s well-known product refreshes and cleans without water in a minute flat. This aerosol product may not have the highest rating on Amazon, but it is undeniably recommended on nearly every beauty blog out there. It’s available in large or small sizes and in a variety of formulations. Batiste dry shampoos have a rice starch-based formula that removes excess grease and dirt from the scalp. It is not tested on animals and comes in a variety of scents and colors. It is not an alcohol-free dry shampoo, unfortunately. The Batiste line has expanded beyond its original formula to offer 10 fragrances: original, blush, fresh, tropical, cherry, wild, floral, bare, neon, and sweetie. They also offer three colored dry shampoo tints depending on your hair color: brilliant blonde, beautiful brunette, and divine dark. Probably the most well-known dry shampoo out there and regardless of the scent or style you choose, you really can’t go wrong with Batiste. Like TREsemme’s dry shampoo, Suave Professionals Keratin Infusion Dry Shampoo is very affordable. It’s one of Amazon’s highest ranking beauty and hair care products ever. With 2,200 four-and-a-half star reviews, this Amazon Choice product sells itself and just plain works. Time and time again, users point out how much Sauve’s Dry Shampoo tames unruly, curly hair and combats frizz like none other. This product, while in no way naturally derived, doesn’t leave behind a white residue. While Suave does make another dry shampoo called Refresh and Revive, it’s the Keratin Infusion that really seems to take the cake. Suave Professionals Keratin Infusion Dry Shampoo has a specific Keralock technology known to smooth and cleanse the hair and leave behind no visible residue. However, it does contain alcohol. Suave’s dry shampoo is far from trendy but it may be one of the best products on this list for the best price. It’s not exactly eco-friendly, but if you want something to just get your hair clean for a few bucks, Suave does the job. Another very affordable dry shampoo at the top of our list is an Amazon Choice product. From our favorite “love yourself” brand, Dove’s Refresh + Care Dry Shampoo is highly-rated on many blogs and websites. This option is also easy to find at many drugstores. The Volume and Fullness dry shampoo not only leaves a clean, fresh scent, it also leaves hair feeling clean, while many other dry shampoos can leave behind a feeling of build-up. If you are looking for a 100% vegan and/or cruelty-free product, then Dove may not be for you. After much research, no information revealed that Dove was, in fact, cruelty-free and considering its parent company, Unilever, is not cruelty-free, it’s safe to say we can’t be sure when it comes to Dove. Dove’s Refresh + Care Dry Shampoo isn’t the only dry shampoo offered by Dove. While this product is the most highly recommended, you can also try out the Unscented or the Fresh and Floral dry shampoos. Dove’s dry shampoo comes in a few different options, is lightweight and clean-smelling, and is great for all hair types. Not much about Dove’s dry shampoo is natural and it does contain alcohol. Dove provides an excellent dry shampoo for regular hair types. If you’re looking for an affordable, basic dry shampoo with a fresh scent and aren’t worried about alcohols and chemicals, Dove is an excellent choice. Living Proof’s Perfect Hair Day Dry Shampoo may be the new kid on the block but it’s quickly risen to prominence as one of the best. It has won 11 awards since 2015, including the 2015 Allure Beauty Breakthrough Award and the 2016 Total Beauty Award for Editor’s Pick of Dry Shampoo. Not a fan of all the hype? Well the ‘proof’ is in the pudding. The Perfect Hair Day Dry Shampoo’s technology that sets it apart from other dry shampoos on the market. Its patented Healthy Hair Molecule (OFPMA) and Triple-Action Cleaning Technology absorbs and removes stubborn oil, sweat, and odor. There isn’t much variety in terms of scents, product types, or colors for this product and the lightweight scent has been described by many reviewers as unpleasant. This product is, however, silicone-free and safe on color-treated hair. Living Proof products are not vegan, but after some research, it does appear that Living Proof does not test finished products on animals, nor do they ask their suppliers of raw ingredients to do so. Living Proof is suitable for every hair type, from curly to straight, thick and fine. Living Proof is one of the newest products on the market and will appeal to the trend-conscious gal. It’s a great option for color-treated hair, but if you’re looking for an environmentally-friendly product or one without alcohol, there are many other great options on this list. While TREsemme offers a Basic version of their Fresh Start Dry Shampoo, the Volumizing spray appears to be a new and improved option. You may know and love TREsemme because it’s easy to find at virtually any drugstore. Fresh Start absorbs oil as well as odor and, according to an Amazon review, has a “pleasant, light smell”. It is, in fact, one of the best-smelling dry shampoos on the list. Fresh Start Volumizing Dry Shampoo, when applied properly, does not leave behind any noticeable white residue, making it great for dark hair types, including Asian hair. Hundreds of beauty gurus and users alike have helped make this product #13 on Amazon’s Beauty and Hair Care ranking. This product is a lightly scented, mineral clay-derived, and affordable dry shampoo. The mineral clay found in this product works to remove excess oil from the hair and scalp while the citrus extract rejuvenates hair. It does contain alcohol, which can unnecessarily dry hair. TREsemme is exactly what you need if you’re looking for a dry shampoo to get the job done for a good price. This product is produced by a large corporation, so don’t expect any eco-friendly promises. Klorane’s Dry Shampoo with Oat Milk was awarded the coveted grand seal of approval as Allure’s Best of Beauty in 2016, cementing this product’s position as one of the best. It also ranks as #5 on Amazon’s Best Seller List for Hair Care. The weightless formula of Klorane’s Dry Shampoo with Oat Milk has been declared the best dry shampoo for fine hair by hundreds of users on Sephora and Amazon. While this product works to cleanse hair, one of its most noted features is its ability to add volume and texture. This product comes in a value-sized bottle and is also available in a 1-ounce travel size, perfect for your purse or traveling. Klorane’s dry shampoo is not scented, but many reviewers claim to love its smell. Unfortunately, there is only one tinted option for brunettes. This dry shampoo is vegan, hypoallergenic, and free from sodium chloride and colorants. Klorane’s organically harvested oat milk works to soothe and protect the scalp. Harkening back to the days before mass production, this product uses corn and rice starches to clean up the hair and scalp. Finally, natural absorbent microspheres and silica remove excess dirt and oil. If you’re willing to spend a little more for an award-winning, environmentally friendly dry shampoo, then Klorane is for you. Just like Aveda’s Shampure Dry Shampoo, Bumble and Bumble’s Pret-a-Powder Dry Shampoo is a non-aerosol powder that is a great alternative to your regular shampoo for greasy hair. While many women prefer an aerosol can for easy use, Pret-a-Powder is easier to regulate and doesn’t run out as quickly as other brands. It’s safe for color-treated hair, straight or wavy, and fine or thick hair textures. To use, shake or squeeze the product directly onto your scalp and massage into hair. Bumble and Bumble also recommends shaking a bit onto your brush and running through hair for easy application. Women can’t seem to get enough of this powdery goodness. Review after review raves about its ability to add volume to flat hair and refresh dull and greasy hair. Pret-a-Powder is highly recommended, non-aerosol, and contains natural starches. It’s free of sulfates, parabens, and phthalates. This dry shampoo contains a natural clay Montmorillonite from the Poitou-Charentes region of France and a new hybrid silicone that absorbs oil without leaving any film behind. Natural starches provide volume and texture and silica removes oil and dirt. Pret-a-Powder is perfect for the brand-conscious interested in trying a powder-based product with a short ingredient list. Aveda’s Shampure Dry Shampoo is the brand’s only dry shampoo and a true miracle-worker when it comes to refreshing hair. It’s also one of only two shampoos on this list that is a dry shampoo powder rather than an aerosol spray. The dry powder mist is spritzed onto hair thanks to a light squeeze of the bottle. The procedure for applying the product is the same as aerosol dry shampoos, but first, the bottle is tipped upside down, then turned upright. The cap is turned to expose the nozzle and with a light squeeze of the bottle, a few puffs of powder can be generously applied to the roots of the hair. Like all of Aveda’s products, its Shampure Dry Shampoo is nearly 100% natural and Aveda works to limit its environmental impact as much as possible. If a more environmentally conscious option is on your must-have list, then Aveda is probably it. Aveda Shampure dry shampoo is an unscented dry shampoo, is sulfate-free, and cruelty-free. Because 99.8% of the ingredients in Aveda’s dry shampoo are naturally derived, this option is the most natural on the list. The organic lavender and 25 pure flower and plant essences make it the best shampoo for dry hair as it contains no alcohol or drying substances. The combination of cornstarch and oat flour work together to remove impurities from the hair. Aveda’s dry shampoo is the gentlest on hair because it doesn’t contain any drying alcohols or scents. It’s also the priciest on the list, but Aveda is a brand you can count to be environmentally conscious. Ouai may not have the clout and presence that household brand names like TREsemme and Dove have, but this dry shampoo option can hold its own. The first and only dry shampoo to come in a foam, Ouai’s Dry Shampoo Foam is a waterless, cleansing foam that removes dirt, oil, and product build-up like a pro. Its paraben-free and cruelty-free stamps of approval make this brand totally worth it, and we aren’t the only ones who think so. Ouai’s dry shampoo is a Best Dry Shampoo for Cosmopolitan’s Beauty Awards and Ebony Magazine’s Great Innovators: Hair-Miracle Cleanser. Positive reviews abound for this foam dry shampoo, including its amazing smell and ability to blend seamlessly into dark hair. Check out this popular YouTube video of women trying dry shampoo foam for the first time. This award-winning dry shampoo is cruelty-free, paraben-free, and is a unique foam cleanser. This product contains alcohol, wheat starch, panthenol, and diatomaceous earth, a naturally occurring, soft, sedimentary rock. By the way, check out our post about diatomaceous earth for hair, it’s such an interesting thing! If keeping up with cool, new brands is at the top of your list, try this foam dry shampoo from Ouai. It’s the most unique on the list and while a bit expensive, is good for dark hair and the most socially conscious buyer. Your favorite brand of hair straightener now has a dry shampoo you’re sure to love. Chi’s Dry Shampoo comes in the signature red can and this product does what it sets out to do: leaves hair looking clean and non-greasy, even after a serious workout session at the gym. This starch-based dry shampoo isn’t as easy to get your hands on as some of the other options on this list. It’s only available through Ulta, Amazon, and Loxa Beauty. Once you do get your hands on it, however, you’ll fall in love with its ability to refresh oily hair without weighing it down. Chi Dry Shampoo, unfortunately, is not cruelty-free nor is it naturally derived, however, Chi delivers a product that is sure to work at eliminating grease from the scalp and hair and offering unbeatable texture. After a thorough dissection of all reviews on Chi’s Dry Shampoo, it seems that the greatest challenge facing this product is not what is inside but how it is delivered. Countless users have complained that the nozzle stops working after a few uses or doesn’t work at all. Chi’s starch-based, lightweight dry shampoo contains Vitamin A for soft, smooth locks, and Vitamin E for conditioning. This product does, however, contain alcohol. Chi dry shampoo does have some troubles like the nozzle issue, but it is still a very decent product that worths its money. If you’re new to the world of dry shampoos, this FAQ section is here to help. This miracle product is a waterless shampoo made of a powdery substance that cleans hair without the need to shower. Most of the time, it comes in an aerosol can and makes getting ready in the morning a breeze. What Is Dry Shampoo Used For? Because of its ability to prepare hair without the whole shower routine, dry shampoo saves you tons of time in the morning. There is no washing, conditioning, or drying. As icing on the cake, dry shampoo also works to keep hair in better health. Washing can dry out hair. Dry shampoos help stretch the time between washes and maintain the natural oils essential for healthy hair. While the best dry shampoo products definitely remove a lot of buildup from hair, it can’t entirely replace a wash. It works best to extend the time between washes for a day or two, but cannot be all that is used on hair. If hair is very dirty, it may take far too much dry shampoo to get it ‘clean’ and give hair a sticky, dry, and powdery texture. While washing hair strips away dirt and oils that have built up on the scalp, leave-in shampoo, a.k.a. dry shampoo, works to absorb that oil. In the past, talcum powder and even clay did the absorbing work. To use dry shampoo, place the spray about 10 inches away from your head and spray evenly, focusing on the roots. Let is absorb for one to two minutes then brush through or use your hand to massage into the scalp. You can use a blow dryer but the beauty of a good dry shampoo is its ability to be used on its own and in a flash! Does Dry Shampoo Add Volume? Yes! Nearly every brand of dry shampoo has the added effect of creating volume. Because grease and oil on the scalp can weigh the hair down, our hair appears flatter. Adding dry shampoo to your roots soaks up that oil and lifts the hair significantly by drying it out. So not only are you giving your hair a quick pick-me-up, styling is easier with the added volume and texture that comes along with it. What Should I Choose: Aerosol or Powder? As you’ve probably already noticed, dry shampoos can come in powder form that you shake or squeeze out or in a more traditional aerosol can form. Aerosol is more common and can be easier to use. It is actually a liquid substance sealed in a metal container under pressure that is released through a spray. Aerosol sprays can contribute to the depletion of the ozone layer in the environment. Powder, on the whole, is better for the environment. How to Use Dry Shampoo Correctly? There is so much information to consider when purchasing a dry shampoo. For many of us, price is a huge factor, but so is animal testing, harmful chemicals, and whether it actually works! With so much information out there, we hope this breakdown can save you a lot of time, energy, and money. Don’t test different dry shampoos unnecessarily, we are here to make sure the right option is here for you. Enjoy the product of your choice and here’s to having more time in the morning for not washing our hair!